Ford’s Hinrichs in ’17: The Bronco will return. In the 800-plus days since Ford Motor Co. flashed a Bronco logo on stage at the 2017 Detroit auto show, development of the highly anticipated SUV has been shrouded in secrecy. But Ford used a gathering of its top-selling dealers last month in Palm Beach, Fla., to take the wraps off a prototype and to divulge plans for a "family" of rugged off-road vehicles, which sources told Automotive News will eventually include a small unibody pickup. Dealers, after relinquishing their phones, were shown an early build of a two-door Bronco and told that a four-door version also would be offered, according to multiple sources in the room. The Bronco is designed to be customizable, with a removable hard top and removable doors that can be stored in the vehicle's cargo area, the sources said. The side mirrors will be attached to the front pillars so they remain in place when the doors are taken off, unlike the Jeep Wrangler — one of the chief rivals Ford is targeting with its Bronco revival. Those in the room said the SUV has a retro design, featuring a rectangular grille, round headlights and the word "Bronco" stamped across the front. The Bronco, a nameplate that Ford killed in 1996, and other off-roaders are key products for the automaker as it ditches unprofitable cars and devotes 90 percent of capital spending to more lucrative light trucks. Ford also showed dealers its small off-roader — unofficially referred to as the Baby Bronco — as well as its upcoming Mustang-inspired, electric crossover with a 300-mile range. Executives did not divulge names for either of the vehicles, due next year. The Bronco reveal was the highlight of the two-day confab, which included a private concert by the band Earth, Wind & Fire and an appearance by legendary NFL quarterback Joe Namath, who handed out Ford-blue sport coats and championship-style rings during a dealer Hall of Fame induction ceremony. The Bronco "was twice as cool as I thought it would be," said one dealer, who asked to remain anonymous while discussing future products. "It's going to be a game changer," said another dealer who attended. 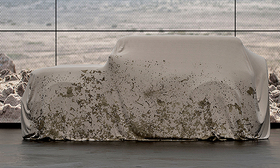 Ford has offered only a teaser image of a boxy SUV draped in a mud-caked covering. Ford described its off-roaders to dealers as a family of vehicles, although the company stopped short of labeling them as a subbrand. The off-road lineup will include the two- and four-door Broncos, the Baby Bronco and the unibody pickup, sources said. Jim Farley, Ford's president of global markets, confirmed plans for a compact pickup in January after Automobile magazine reported that Ford was working on such a vehicle. This is the first time, however, that the pickup has been tied to a larger off-road lineup. 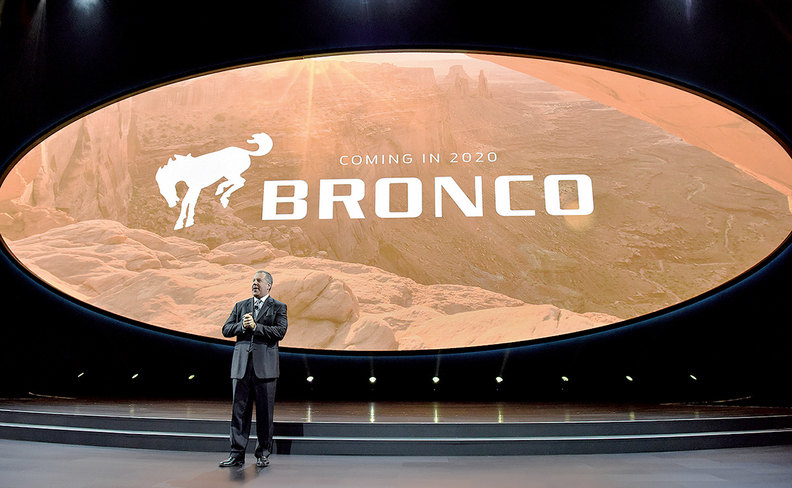 Dealers were told the Bronco would be available in late 2020, as soon as three months after the Baby Bronco. The unibody pickup isn't expected until at least 2021, according to another source with insight on Ford's product plans. CEO Jim Hackett did not attend the meeting, but most of Ford's senior leadership team was there, including Farley, Joe Hinrichs, Kumar Galhotra, Mark LaNeve, Matt VanDyke and Elena Ford. Ford plans to make the Bronco at its Michigan Assembly Plant, alongside the Ranger midsize pickup that went on sale in January. The automaker has been tight-lipped about the vehicle, offering only a teaser image of a boxy SUV draped in a mud-caked covering. It declined to show even an image or rendering at larger dealer gatherings such as the National Automobile Dealers Association Show in January or a meeting in Las Vegas last fall, when it displayed photos of the Baby Bronco and other future products. During the Las Vegas gathering, Farley teased dealers by promising to show them a Bronco, which turned out to be a picture of his own classic 1973 model. A Ford spokesman declined to comment on details of the Bronco.